The Sound Guitar Magazine is a high quality online magazine set up by Jason Macedo, who studied with the great Shawn Lane back in the day. 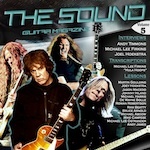 The magazine is absolutely free to download from www.thesoundguitarmagazine.com and is packed full of transcriptions, interviews, special features and lessons from some of the best players in the world! Check it out! Issue 5 features a tribute to the great Gary Moore, with respects from Paul Rodgers, Joe Bonamassa, Phil Collen and Steve Morse amongst others. Also featuring interviews from Andy Timmons, Michael Lee Firkins and Joel Hoekstra. The lesson section features my masterclass in alternate picking odd note groupings, as well as articles by Johnny Hiland, Rowan Robertson, Mike Campese and Andy James amongst others. Amazing value for no money! Download it now! This entry was posted on Thursday, May 19th, 2011 at 11:16 pm	and is filed under News. Responses are currently closed, but you can trackback from your own site.